Samples undergoing a weather test. 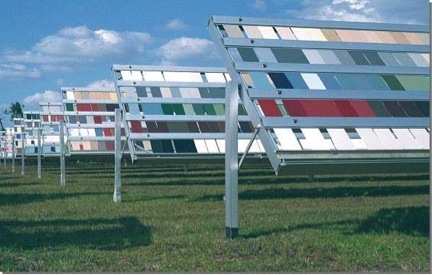 Weathering is a routine performance test to determine durability of paint and plastics under extreme weather conditions. The most popular areas for weathering studies are located in AZ and South FL. Samples can also be placed into chambers that can simulate changes in temperature, humidity and UV levels. Measuring changes in color and gloss are two important tests to monitor weathered samples. BYK-Gardner developed the spectro-guide sphere gloss to measure both color and gloss on the same spot in accordance with the ASTM methods. Weathering can cause degradation of the colorant and resin. One would see this as a color change. The color would usually appear lighter in the L* value and yellower in the b* value. A sphere, specular-included designed color instrument is best suited to measure color shift due to raw material degradation. Weathering can also affect the surface of the coating causing cracking, caulking and pitting. UV light absorption can cause degradation of the bonds of certain polymers used in paint systems. Changes in the surface of paint can be evaluated by measuring gloss. The gloss measurement is more sensitive to physical breakdown of a painted surface compared to a color measurement. How do you take into account the weathering on your product?